The City of Seattle has launched a new development map, and for users of Seattle in Progress it will feel very familiar. The layout and design, the information presented, even the name (“Shaping Seattle: Buildings”) all borrow heavily from Seattle in Progress. Sadly, that’s not the result of any collaboration—the City has just made a (poor) copy of Seattle in Progress. Two views of U-District construction: Seattle in Progress next to the City’s new site. There are plenty of differences between the two sites, but the most important issues to many users are comprehensiveness, timeliness and accuracy. In all of these respects, Seattle in Progress equals or beats the City’s own site. In terms of comprehensiveness, Seattle in Progress is working with the same official permit databases as the City’s site. Seattle in Progress loads the complete dataset automatically, without any manual data entry that would allow for errors or omissions. In terms of timeliness, Seattle in Progress updates its data every night through entirely automated mechanisms. This contrasts with the City’s app, which relies on City staff to manually capture and upload a screen shot from each new design proposal. If the City falls behind on this daily task their site will become out of date. Finally, in terms of accuracy, Seattle in Progress puts a lot of effort into correctly interpreting ambiguous permits. 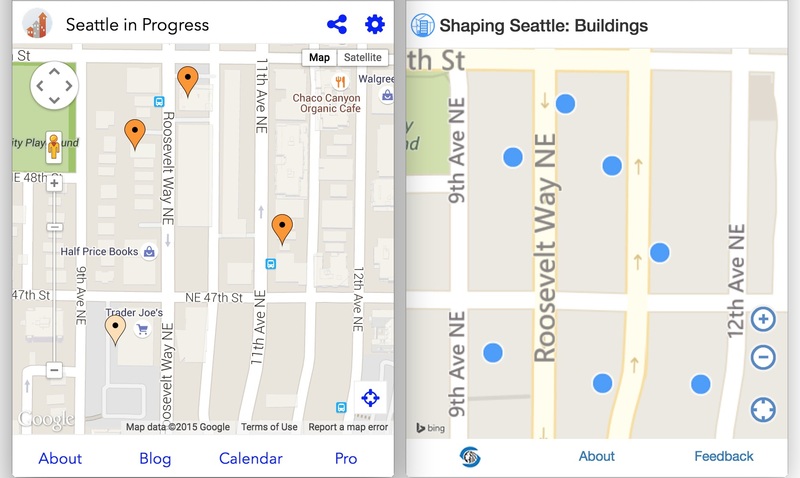 In the screen shots above, you’ll notice that Seattle in Progress shows four projects while the City’s site shows seven. This is not because Seattle in Progress is less comprehensive. It’s because the City is incorrectly reporting three completed projects as being still under way, a mistake that’s widely made on the City’s map. You’ll notice some other functional differences if you play around with the two sites. Seattle in Progress lets you swipe through the pages of the design proposals on your phone or desktop; the City’s site requires you to download a large PDF, which is slow on desktops and nearly unusable on a phone. Seattle in Progress provides a calendar of upcoming meetings and lets you subscribe to calendar updates over email, Twitter or Facebook; the City’s app has no easily accessible calendar. Seattle in Progress colors pins by project status and gives you the option to include single-family construction; the City’s app shows only larger projects and makes no attempt to distinguish the pins of proposed, approved or completed projects. When Seattle in Progress launched in November 2014 I had hoped to be able to collaborate with the City. Unfortunately, despite strong support from City staff, I wasn’t able to get any decisions makers to engage in a substantive discussion. Still, the City’s attempt to replicate Seattle in Progress validates our efforts: as a civic technologist, one of the the most impactful outcomes I can hope for is to push government to improve its own technology. GeekWire has more coverage of what happened: City of Seattle Takes Cues from Indie App. The City will hopefully make improvements to their site over time. In the mean time, there are a number of great new features in the works for Seattle in Progress (many of which are available today in our Pro version). Stay tuned for more announcements soon.